Highlighting many of America's earliest western vehicle makers, this exclusive lithograph profiles an 1800's transportation empire. These were among the most legendary names outfitting the gold strikes, military campaigns, pioneer travelers, homesteaders, freight haulers, railroads, and cattle industry. Celebrate a powerful legacy of the Old West with this impressively sized 26" x 39" limited edition print. Featuring rare illustrations from vintage engravings and original lithographs, these wooden wheels carried the hopes, dreams, and unquenchable spirit of an emerging nation. Company names, locations, and establishment dates are also included. Don't miss your opportunity to own such a rare piece of American history. Makes a great gift! 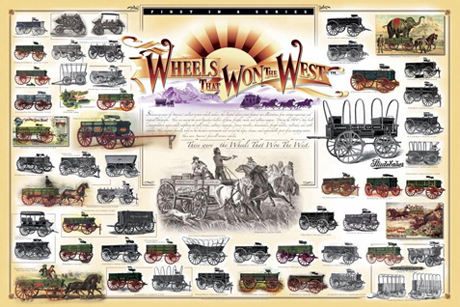 Wagon makers that are included on this poster are: Abbot-Downing Co.; Bain Wagon Co.; Beggs Wagon Co.; Birdsell Mfg. Co.; Brown Mfg. Co.; Burg Wagon Co.; Caldwell Wagon; Charter Oak; Eclipse Wagon; A.A. Cooper Wagon Co.; Coquillard Wagon Works; Fish Bros. Wagon Co.; Flint Wagon Works; Florence Wagon Co.; Harrison Wagon Co.; Huntingburg Wagon Works; J. Murphy & Sons; Jackson Wagon Austin, Tomlinson, & Webster; LaBelle Wagon Works; Lamons Wagon Co.; Luedinghaus-Espenschied; Milburn Wagon Co.; Miller Wagon Co.; Mitchell Wagon Co.; Moline Wagon Co.; Newton Wagon Co.; Geo. E. Nissen & Co.; Kentucky Wagon Co.; Olds Wagon Co.; Owensboro Wagon Co.; Pekin Wagon Co.; Peter Schuttler Wagon Co.; Piedmont Wagon Co.; Springfield Wagon Co.; Stoughton Wagon Co.; Studebaker Wagon Co.; T.G. Mandt Wagon Co.; Troy Wagon Works; Turnbull Wagon Co.; Webber & Damme; Weber Wagon Co.; Webster Wagon Co.; and Winona Wagon Co. Ships in an oversized, heavy-duty 5" tube with protective cover sheet for the print. $88 plus U.S. s/h -- Available exclusively from a select group of retailers.